The Ports-to-Plains Alliance has one big New Year’s resolution for 2017 – see the designation of an extended Interstate 27. There are some simple steps highlighted in this newsletter that you can take to help us achieve this goal. First is to go to our website and add your name personally to our resolution supporting the extension of I-27. We are asking all of our member organizations to pass resolutions of support for the extension of I-27, but we are also submitting the resolution to the Texas Transportation Commission, our state legislators and members of congress and would like to have as many individuals listed in support as possible. Second you need to make plans to attend one of the Texas Department of Transportation workshops where they are seeking public input for their update of the Texas Freight Mobility Plan. It is absolutely vital that there is a strong turnout of Ports-to-Plains Supporters at these meetings delivering the message that the extension of Interstate 27 is a top priority for our region. Along the Ports-to-Plains Corridor there will be a meeting in Laredo on Jan. 31, in Midland/Odessa Feb. 22 and in Lubbock Feb. 23. Third it is that time of year again to renew your membership in the Ports-to-Plains Alliance. The support of our members enables us to work for you in advocating for the investments in infrastructure that have helped our region to grow and prosper. You can see from our 2016 Report Card that we achieved a great deal for our members last year, and we have an aggressive agenda set for 2017. With your continued support we will continue to make great strides. The proposed extension of Interstate 27 intersects with Interstate 40, Interstate 20 and Interstate 10. 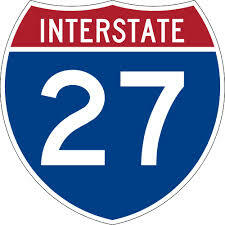 The city officially shows their support in expanding I-27. The city council passed a resolution to support extending the highway south of Lubbock and north of Amarillo. It's said this would make it easier to travel to places like Colorado. It could also make it safer to travel with more lanes to drive on, and keep the Texas economy, including Amarillo's very competitive. Amarillo Mayor Paul Harpole tells us, "I-27 is the shortest interstate in the country as I understand it. This would extend it on south so it would tie into other freeway systems in Texas and help that traffic go up through Amarillo and go back." Current members of the Ports-to-Plains Alliance have received their invoices by email for renewal for 2017. 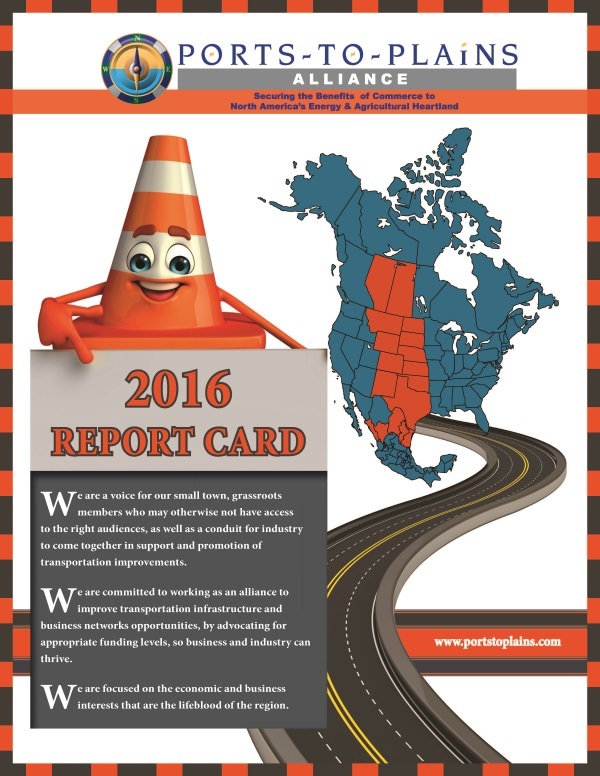 See below for the 2016 Report Card to review the accomplishments for 2016. Your support is critical to those successes. Our new membership platform sends messages including renewal messages and newsletters from pal@memberclicks-mail.net. Be sure this address is on your safe list. If you have not received your invoice please contact Duffy Hinkle, Vice President of Membership and Marketing ay 806-775-3373 or duffy.hinkle@portstoplains.com. If you were not a member of 2016, and would like to join, just click here. The Ports-to-Plains Alliance continues to bring together communities across North America in support of a robust transportation system providing opportunities for economic growth in our communities. 2016 was built on past successes and certainly created new opportunities. The corridor saw $480 million in expansion construction projects across the United States. Our President, Michael Reeves, is focused on the potential expansion of Interstate 27 in Texas. Developing strong support at community, state legislature, transportation commission, and TXDOT levels will be critical to this important designation moving forward. The Texas Freight Mobility Plan states: “In terms of the Primary Freight Network - Interstate Corridors implementation priorities include the development and completion of new corridors by giving additional consideration to the extension or designation of other interstate routes to interstate standards. Examples include I-27.” There is a growing recognition that an integrated freight system using I-35 and Ports-to-Plains/I-27 is not only viable but economically necessary. Implementation of the FAST Act saw a significant milestone in the recognition of the value of the entire corridor. The departments of transportation in Texas, Colorado, Nebraska, Wyoming, South Dakota, North Dakota and Montana each made recommendations that the corridor through their respective state needs to be included in the Final National Multimodal Freight Network as critical rural freight corridors. This may be the strongest evidence yet that the full corridor is increasing value in the eyes of the DOTs. More exciting news in 2016 is that the Alliance is moving to expand its business memberships. With a strong base of local governments, economic development interests and chambers of commerce, involving business and industry in the Alliance can only improve our voice at local, state and national levels. Businesses, be they Builders, Users or Travelers of the expanded transportation system, benefit. You will see the tagline: TOGETHER DRIVING CHANGE. Nothing is truer. The broader the Alliance is, the stronger the voice is about the economic opportunities presented by expansion of the corridor. Yes, 2016 was a bright year… and the future is getting brighter for the communities and businesses throughout the Ports-to-Plains region. We thank you for your past and future support as we look forward to the coming years. The Texas Department of Transportation (TxDOT) in partnership with the Texas Freight Advisory Committee, federal, state, regional, local, private and public stakeholders is leading efforts to update the Texas Freight Mobility Plan so it is compliant with the 2015 federal transportation legislation, the Fixing America’s Surface Transportation (FAST) Act. The update will help ensure the transportation system moves goods safely and efficiently throughout the state and continues to support Texas’ economic growth and competitiveness. Workshops will be held across the state beginning January 31. We are looking for input from businesses, freight, and logistics industries, along with state, regional, local government and economic development agencies, chamber of commerce, trade associations, residents, and other interested parties on ways to improve the state’s transportation system. You’ll see commercial trucks along busy roads and highways. They often carry goods to and from the United States. But how far can a single truck go within 7 days? A recent study about trade and Texas roads aims to find out where trucks may end up. The US Dept of Transportation estimates registered commercial vehicles travel over 250 million miles per year. Recently the Texas Department of Transportation and nationwide partners kept a close look on 2000 trucks. GPS Findings show that within 7 days, a truck traveling from Brownsville can end up in almost all 50 states. The freight industry works year round. Oftentimes drivers will spend their time away from home, driving hundreds of miles just to get their cargo in on time.